I've spent the last few weeks breaking down the prototype Sherman into its basic components. This has been a major task due to the length of time it has been sitting out in all weathers. One of the problems I was not expecting was the damage to the driven gear casing caused by the bolt heads on the inner sprocket ring. These had gouged a ring into the face of each of the casings. This was made much worse by the fact that the centre hub on each casing had been forced inwards, either due to collision damage or simply the tension under which the Sherman track runs. I should point out that on the production Shermans, this part is made from a much more substantial thickness of aluminium, so I don't expect this will be a problem on them. To repair the damage, I used DuraFix aluminium brazing rods. To use these, you first clean the part with a stainless steel wire brush, to remove the surface oxide layer. Then you heat the part with a butane or MAPP torch until the brazing rod melts when in contact with the part. You then continue to heat the part and build up the required amount of "filler" aluminium. Last edited by Adrian Harris on Tue Jul 28, 2009 8:15 pm, edited 2 times in total. Once each of the parts cooled down, I filed away the excess filler material and then blended it in with emery cloth. I hope that the Sherman will run straight and true. To get the hub in the correct position, following the initial bashing, I used my bench vice in conjunction with a socket spanner and a number of washers to ease the hub into the correct alignment. I was dreading doing this as the prototype uses a different driven gear, with a different thickness of drive shaft. It also doesn't utilise the taper bush found on later vehicles, so if I couldn't repair these parts, I would have had to replace pretty much the whole of the two sprocket drive systems. That is a superb repair which reminds me f the sort of stuff I had to do when I restored a couple of stationary engines some years ago, or barn engines as our US colleagues would call them. You will have to make sure that this cannot happen again when you rebuild the tank. It is a couple of years ago when I built up my Sherman's final drives so I don't remember detail well, but you need to ensure that the shaft and final gear cannot move in and out in the bearings and also ensure that the sprocket nuts have sufficient clearance without the sprocket being out of line with the road wheels. When you assemble the tracks you also need to ensure that the duck bills are tight against the treads so that the tracks fit inside the sprocket without binding. I would also strongly recommend putting an additional 2mm nut under the little spring clip on the tracks so that you can fully tighten the third nut to hold clip solid. Stewart - it didn't feel like engineering at the time - especially when I realised how hard I was going to have to hit it to get the change I needed !! 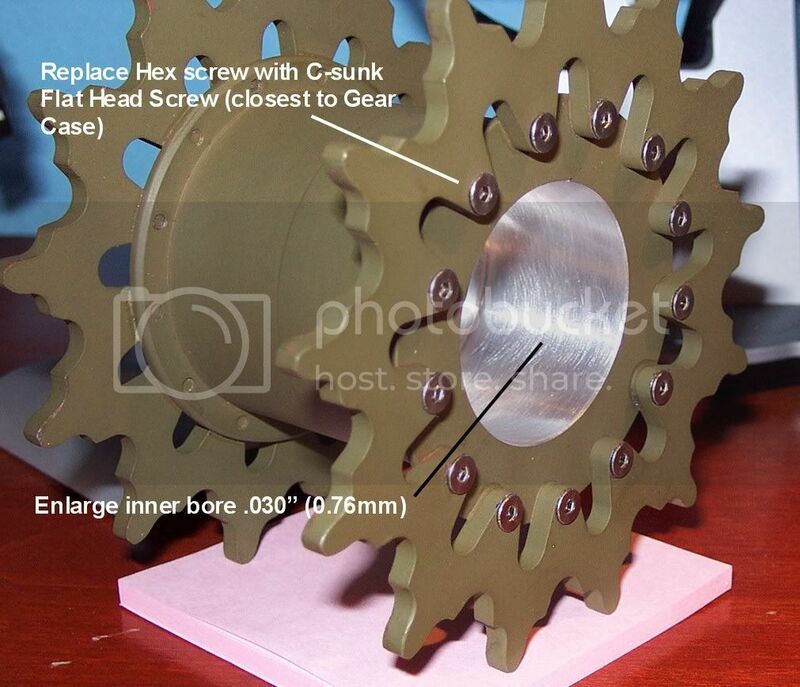 Jeff - not sure what you mean by strengthening - there's not really enough clearance between the sprocket and the casing to build up the thickness and on the inside is just a cut-out for the drive gear so no room there. I think I'll just have to be careful how I drive her once she's up and running. Allan - I am wanting to rebuild this tank back to it's original condition "warts and all" but I do think I'll use countersunk screws on the insides of the sprockets to give more clearance. The problem is that the track pins were simply lengths of mild steel, with no plating, so pretty much every one of them had seized inside the track link. I've got them all apart now but the cap head screws in these end connector blocks were also all rusted in place so I'm not sure how many of the threads will have survived enough to be operational once I rebuild the tracks. Perfect looking repair job with the grooves on the gear housing! Well done. Those tracks look like a daunting task. Couldn't you get the fasteners needed to bring them up to working order from Gill and Mark? I also wanted to say that it's nice to see another Sherman project on the forum. Please keep the photos coming. One of the problems with working on these prototypes is that they are, by definition, unique. For me, it would spoil the history of the model to move to using the production parts instead of the originals, even if I have to rebuild/recreate the originals. Great repair job on the gear cases. Like Tim I am glad to see something happing on the Sherman forum! Do you have to worry about heat distortion when using the braze rod? It looks like nice material to work with. The rust on the track shoes looks great! No so much on the end connectors! Thats going to be a job to get those parts separated without damage. Maybe soak the whole track in kerosine? I replaced the hex nuts on the inner sprockets with flat head screws to prevent such a problem with my gear cases. My shermy is a production model so maybe its not an issue, but this is additional insurance. I had problems with the sprocket inner bore rubbing the boss of the gear case, so I relieved the inner diameter of the sprocket a bit. > Do you have to worry about heat distortion when using the braze rod? On the parts I'd brazed so far there doesn't seem to have been any distortion. It's very scary to start with as you have no idea how hot the aluminium is becoming or how much futher you have before reaching melting point. > Thats going to be a job to get those parts separated without damage. They're all separated now, with just a few of the end connector wedges still having the remnants of screws stuck in them. > Maybe soak the whole track in kerosine? I tried diesel fuel, WD40, PlusGas and even the homebrew of acetone and auto transmission fluid but none seemed to have any effect on the parts. The only thing which worked reliably was heat from a butane torch. That was how I removed the track pins - clamp the pin in the vice, heat the track link for ten or fifteen seconds and then grip it tightly in a pair of leather gauntlets and twist the link from the pin. I think this is a must. > I had problems with the sprocket inner bore rubbing the boss of the gear case, so I relieved the inner diameter of the sprocket a bit. There are witness marks on one of the casing hubs from where the sprocket has loosened and rubbed. I may ease out the inners as well, to give more clearance, though if I can't get the seven broken screws out of one of the sprocket centres, I may end up turning new ones from scratch.